The Askew Sisters - the acclaimed English Folk Duo making waves on the folk scene with their energetic brand of English folk music. When Martin Simpson and co played the magical Elizabethan Sessions at Cecil Sharp House earlier this year, Emily Askew’s arsenal of early-music instruments came close to stealing the show. She’s now reunited with her sister Hazel on another meticulously researched folk project. The duo draw on a narrow palette, vocals shimmering above fiddles, viola, melodeons and concertina; but the range of the songs, from the melancholia of The Young Girl Cut Down in Her Prime to the jaunty Old Father William, slowly casts its spell. 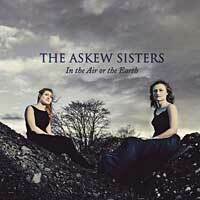 THE ASKEW SISTERS – Emily on fiddles and viola and Hazel on melodeons, concertina and vocals – offer inspired arrangements of traditional music on In the Air or the Earth, an album produced by Andy Bell. There are striking versions of tricky ballads such as The Unquiet Grave and The Wife of Usher’s Well. The sisters also cut loose on vibrant instrumentals including Our Cat Has Kitted/Crimson Velvet. Old Father William has its origins in Lewis Carroll's Alice's Adventures in Wonderland. This is traditional folk in a fine fresh form. The third album from Emily and Hazel Askew is surely a definitive album of the current English Folk scene. In the Air or the Earth brings together many strands of music, history and that somewhat indefinable element of cultural identity. Hazel won Best Female Singer at the 2011 Spiral Earth Awards, and you can hear why so many people voted for her right here. Emily was recently part of the Elizabethan Sessions organised by EFDSS and Folk by the Oak, and she sent us a regular blog from the project. That interest in music that has its roots in the medieval period informs much of what the pair produce, melodies have time to develop naturally through slowly building and growing energy, lyrics feel rooted to the rhythms of the land as much as to that the of the music. We have been in a slow move away from the styles and textures of the 50s and 60s folk revival. For some time that huge amount of material has defined the ‘tradition’, but there is a crop of artists who understand the revival but also look beyond that recent movement, and further back even than Sharp, Vaughn Williams and the like. They take the material collected and composed by them and use it in an organic way that allows fresh growth to show through. On this record they are exploring and revelling in hundreds of years of musical forms and traditions, the result is a beautiful album and one which defines all that is good and vibrant about the contemporary English Folk scene. Tradition withstands neglect, desertion and the grinding pace of time. Despite whatever afflicts it, the depth of tradition endures, and as long as artists like The Askew Sisters nurture its existence, In the air or the earth Askew Sisters interpret and rework its essence, it remains. Whenever you get a chance listen to their new album ‘In the Air or the Earth’, seize it and you will become imbued with their slice of folk tradition through a gathering of ballads and dance tunes and combination of fiddles, viola, melodeons and concertina, augmented by evocative vocals. There are songs that move you through striking dark and light tales, drawing your attention with their melodies and holding it with their narratives. There are tunes that speak to you from the first, without need of words, yet begging your soul to join the dance. The echoing sweep of ‘The Maid on the Shore’ takes you to the heart of their storytelling, as does their interpretation of the despair and hope in ‘The Wife of Usher’s Well’, and the dealing-with-death theme continues through ‘The Unquiet Grave’. Through the combination of instruments and voice Emily and Hazel impart tangible levels of sympathy and character into these songs, sensing and relating to the heritage each offers. There’s also superb version of Lewis Carroll’s rhyme with ‘Old Father William’ set to a Morris-style tune penned by Hazel. Turning their attention towards dance, Emily and Hazel captivate with spritely Morris tunes ‘Room for the Cuckold/ Beaux of London’, revive timeless early music with ‘The Whitehall Minuet/ Hare’s Maggot’ complete with lilting vocals, while the splendid combination of hornpipe and stately tune ‘Our Cat has Kitted/ Crimson Velvet’ offers more distinctive attraction. Music like this is not created without an abiding empathy and tenderness for its heritage, coupled with the skill to illuminate it so well. It’s a combination that has crafted ‘In the Air or the Earth’ - an album of singular and iconic beauty.